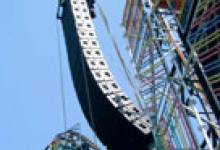 Revolutionary line source array technology has been used at outdoor events for the first time in Australia. The new V-DOSC system performed flawlessly to huge crowds at the recent Jazz in the Domain performance, the Olympics closing concert featuring Savage Garden, and at the Olympic Volunteers concert. The V-DOSC system was supplied by Jands Production Services, the newly appointed network partner for V-DOSC rentals. Part owner and head of sound operations, Peter Ratcliffe, says he was amazed at its performance. Artists from Pavarotti to Van Halen, Supertramp, Rod Stewart and Metallica are currently touring with V-DOSC speaker systems while other uses include the most recent Grammys, Superbowl, Academy Awards, and the current London productions of Mamma Mia and The Witches of Eastwick. Jands Production Services, Australia’s leading supplier of sound, lighting and rigging systems, joined forces with L-Acoustics earlier this year for all V-DOSC rentals in Australia and New Zealand.